What a jam-packed value-priced collection! 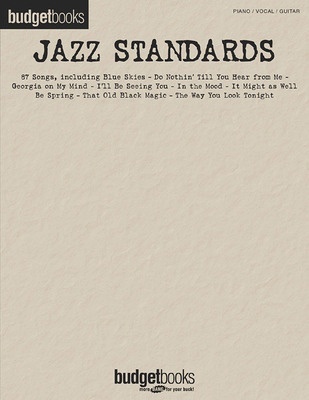 Over 80 jazz classics including: Alfie · Alright, Okay, You Win · Always in My Heart (Siempre En Mi Corazon) · Autumn in New York · Bewitched · Blue Skies · Body and Soul · Cherokee (Indian Love Song) · Do Nothin' Till You Hear from Me · Fever · Fly Me to the Moon (In Other Words) · Good Morning Heartache · Harlem Nhe · Harlem Nocturne · I'll Be Seeing You · In the Mood · Isn't It Romanocturne · I'll Be Seeing You · In the Mood · Isn't It Romantic? · Lazy Afternoon · Lover · Manhattan · Mona Lisa · Stella by Starlight · When Sunny Gets Blue · and so many more. These Budget Books really live up to their name!